Item Number: 810-1201 19512 Actual Weight: 1 lb. Extends the functionality of electrical outlets. 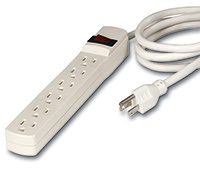 Power strip features 6, 3-prong outlets and a circuit-breaker for safety. Total combined load on the 6 outlets should not exceed 15 amps.